Last week saw an announcement by Genting that it would be using the two ships it has on order at Meyer Werft for delivery in 2016 and 2017 to launch Asia’s first premium class cruise line. To be called Dream Cruises, the line’s new ships will have a passenger space ratio about 5% higher than Celebrity’s Solstice class vessels. Meanwhile, in Canada, the Port of Vancouver is slowly recovering from the onslaught it received from Seattle several years ago after newer and faster ships saw more Alaska cruises sailing the extra distance from Seattle. Finally, we have updates on previous stories on Crystal River Cruises and Thomson Cruises. Genting Hong Kong has unveiled plans to target Asia’s premium cruise market with the introduction of Dream Cruises, the first-ever Asian based premium brand. On board Star Cruises’ SuperStar Virgo, Genting chairman Tan Sri Lim Kok Thay announced the launch of Dream Cruises with the two new ships now under construction at Meyer Werft. The new brand will cater specifically to Asia’s premium sector and its first ship, Genting Dream, will debut in November 2016, while sister ship World Dream will enter service in November 2017. Genting Dream will serve three homeports in Guangzhou’s Nansha port, Hong Kong and Sanya, and will offer a variety of cruises running from two to seven days. “Being the first company to offer cruises in China over twenty years ago with Star Cruises, we conceived Genting Dream three years ago to be the only purpose-built premium category new build for the Asian, and specifically Chinese, market. “Dream Cruises’ ships will be the most spacious ships in Asia Pacific and provide the highest level of guest service in the region,” said Tan Sri Lim Kok Thay. To see how this works, here is the comparison with Genting’s new Crystal orders being built by Genting-Owned Lloyd Werft in Germany and Celebrity’s Solstice class, which like the Dream class ships, are a product of Meyer Werft. By comparison, the Dream class ships offer almost 15% more space than Norwegian Cruise Line’s Breakaway Plus class ships, also from Meyer Werft. The Breakaway Plus class have a passenger space ratio of 39.2 gross tons per passenger. The launch of Dream Cruises completes Genting’s mission of having a brand for each cruise market segment – Crystal Cruises for the luxury segment, Dream Cruises for the premium segment and Star Cruises for the contemporary segment. Genting Dream will carry 3,364 guests and 2,000 crewmembers, giving the 150,000-ton vessel a large guest space ratio of 45 tons per guest, as well as the highest crew-to-guest ratio at 1.7 of any Asia-based ship. The ship will also have 35 restaurants and bars. Accommodations aboard Genting Dream will reflect both size and choice for travellers, with 70% of Dream class staterooms offering private balconies, and more than 100 connecting rooms will cater to larger extended families. The ships will also have the Genting Club, a boutique hotel within a hotel, with 142 suites offering special guest privileges. Dream Cruises has appointed one of the original Crystal executives, Thatcher Brown, as president. Brown has luxury brand experience with Fairmont, Jumeirah and Four Seasons, among others. Other Crystal executives will also be coming on board to assist in setting up the new brand. 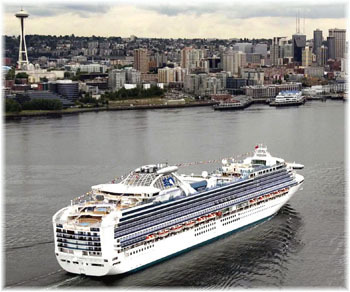 The Port of Vancouver is projecting that its 2016 cruise season will be the busiest since 2009, with a forecast of approximately 829,000 passengers departing or arriving Vancouver next year. The 2009 total was 898,473. This still remains well below 2002’s total of 1,125,252, but is substantially up from 2010, when Vancouver attracted a seventeen-year low of 578,986 after haemorrhaging business to newly-opened cruise terminals in Seattle. The current cruise season, which is set to close on December 15, when Princess Cruises’ 3,114-berth Ruby Princess departs Vancouver for Los Angeles, is the longest in many years. It is estimated that it will finish with a total of about 805,000 passengers carried on 32 ships making 228 voyages. Next year’s passenger total is expected to be 3% higher despite the number of sailings dropping by one, because cruise lines are using bigger ships. Even if Vancouver passenger numbers have only dropped by less than 1% in each of the past two years a rise in total passengers is still very good news for the sector. In other good news, Crystal Cruises will start and finish cruises in Vancouver in 2016, making six sailings to Alaska using both its existing ships. Crystal has not home-ported in Vancouver since 2005 and has instead been making occasional one-off calls. 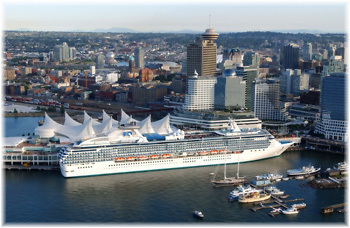 Vancouver is able to take advantage of increasing global demand for cruising as well as a low Canadian dollar, as many cruise tourists also spend time in Vancouver. It is also particularly positioned to take advantage of growing Asian demand for cruises with the large number of direct flights now connecting Vancouver with China. An average of more than ten flights a day now link Vancouver with mainland Chinese cities during the summer cruising season. 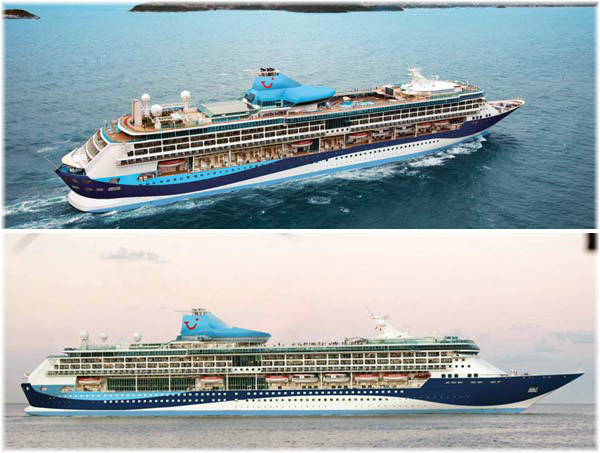 Thomson Cruises has announced that on delivery of the Thomson Discovery from Royal Caribbean Cruises it will introduce a new colour scheme for its ships, based on blues and whites. 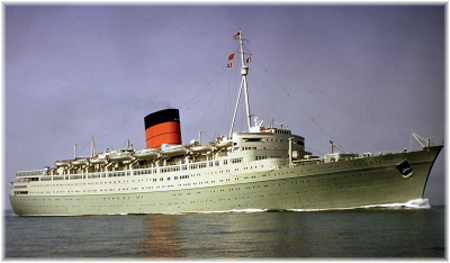 While some have likened this to Cunard Line’s use of four shades of green in the purpose-built Caronia (otherwise known as the “Green Goddess”) in 1948, others have compared it to camouflage used by landing ships. Both comments are extreme but the new scheme will certainly differentiate Thomson Cruises from its German half-brother TUI Cruises. 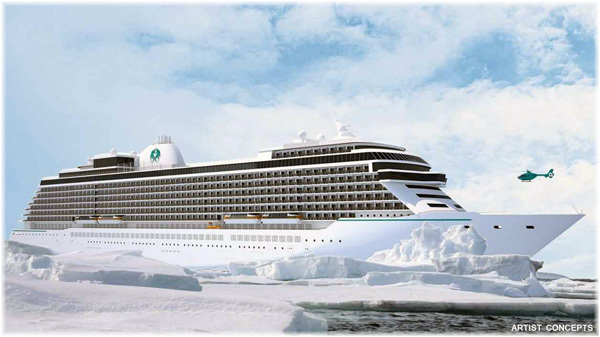 Meanwhile, Crystal Cruises has released the names for the new river cruisers it is having built by Lloyd Werft. The two 110-berth vessels are to be called Crystal Bach and Crystal Mahler (Crystal Beethoven might have had a better ring to it) and the 84-berth vessels trading in France and Portugal, Crystal Ravel and Crystal Debussy. The Danube cruiser Mozart, now undergoing refit, and due to enter service next year as Crystal Mozart, seems to have set this composers scheme for river vessels.